A gold dredge is a necessary tool for anyone who pans for gold as more than a hobby. Gold dredges are machines that pulls the gold from dirt or gravel. The gold dredge became popular at the time of the California Gold Rush, when thousands were looking for the shiny mineral as a way to strike it rich. Gold dredges can be as complicated as machinery attached with vacuums and hoses, or as simple as a homemade gold dredge sluice box. If you are just getting into the gold-finding game, making a gold dredge sluice box is a great way to start. Cut a piece of plywood to 1-foot long by 4-feet wide. This size is easy for one person to handle, and is large enough to dredge through a good amount of soil and gravel at once. This piece of plywood will be used as the bottom of the dredge box. Cut an additional two pieces of plywood for the sides, they will be 4-feet long by 8-inches wide. Cut a wooden dowel, approximately 1-inch wide and square, into eight 1-foot-long pieces. These pieces will support the gold dredge. Screw on a dowel to the end of the plywood that you cut for the base. Make sure that the dowel is even with the edges of the base and is flat, or flush, with the sides of the plywood base. About 6 inches from the first dowel segment, place another section of dowel. Continue every 6 inches until you have six dowel pieces screwed in. Screw in both side pieces of plywood onto the base piece. Make sure that they are perpendicular to the base board. The pieces of dowel will be on the inside of the box formed by the three wooden pieces. Screw the last two dowel pieces onto the side boards as support. They will be screwed into the top of the side boards from one side board to the other as a support to keep the side boards up. Run water and soil down the dredge from the side without dowel pieces and allow the water to run over the dowels. The soil and gravel will run down while minerals and other items will sit on the dowels. 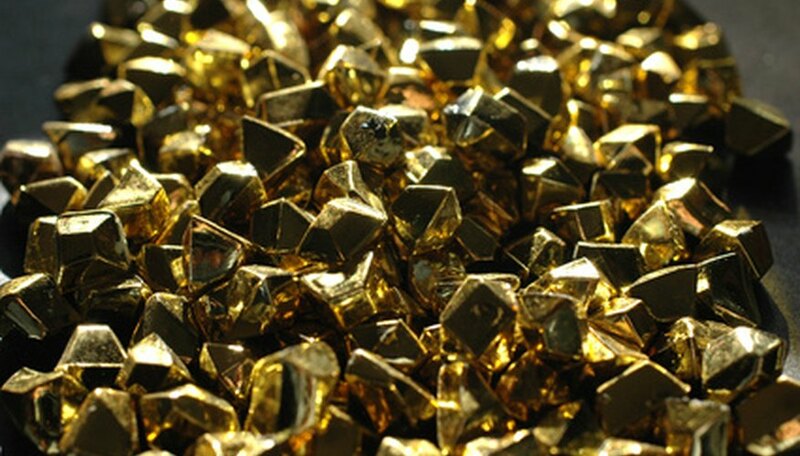 Gold will be caught by the dowels so that when you remove the dredge, you can pick out the precious mineral.